Song Cycle is the debut album by American recording artist Van Dyke Parks, released in December 1967 by Warner Bros. Records. It mixes a number of genres, including bluegrass, ragtime, and show tunes – framing classical styles in the context of 1960s pop music. Upon its release, Song Cycle was largely raved by critics despite lukewarm sales, and later gained status as a cult album. With the exception of three cover songs, Song Cycle was written and composed by Parks, while its production was credited to future Warner Bros. Records president Lenny Waronker. The album's material explores unconventional song structures, and lyrically focuses on American history and culture. The subjects of many songs are Southern California locales, including Laurel Canyon Boulevard, Vine Street, Silver Lake Boulevard, and Palm Desert. The lyrics on Song Cycle also reflect Parks' history working in both the film and music industries of Southern California. 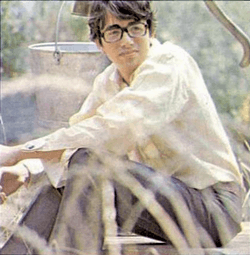 In Los Angeles during the mid-1960s, Van Dyke Parks became known as an in-demand session pianist, working with such artists as The Byrds, Tim Buckley, and Paul Revere & the Raiders. At the same time, he had been unsatisfied with contemporary pop music and its increasing submissiveness to the British invasion, going so far as to say, "apart from Pet Sounds I didn't find anything striking coming out of the United States." Wanting to give "an American experience which would be uniquely disassociable from the Beatles/British pop viewpoint," he was involved with numerous works that would indulge his interest in Depression-era American pop and folk music, such as co-writing and arranging much of Harper's Bizarre's second album Anything Goes; releasing his own singles "Come to the Sunshine", "Number Nine", "Colours"; and most notably providing lyrical content to The Beach Boys' ill-fated Smile album. For his collaborations with Brian Wilson, Parks was signed as a recording artist by Warner Bros. Records. The label reportedly expected that Parks could deliver a smashing commercial success on par with the Beach Boys at that time. The resulting album was backed by producer Lenny Waronker, who placed Parks' musical freedom over budgetary constraints. Being one of the most expensive albums ever produced up to this time, the album made early use of an eight-track professional reel-to-reel recorder, which was used to mix second generation four-track tape that had been transferred from another four-track recording for overdubs. This was during an era when most studios were still limited to four-track machines. Parks has added that the bulk of the album was done "before Sgt. Pepper reared its ugly head", and that Randy Newman had written "Vine Street" especially for him. Many Los Angeles recording facilities were used, not because of any particular sound preference, but to maximize studio time. Song Cycle contained experimental production and recording methods, including varispeed and regenerated tape delay. Audio engineer Bruce Botnick is credited for inventing the "Farkle" effect, an ingenious modification to a Sunset Sound Recorders echo box. The Farkle effect was used most prominently on violins, harps, and the intro to "The All Golden", and involved very thin splicing tape folded like a fan attached to a tape overhead. Three-quarter-inch masking tape was creased in eighth-inch folds and wrapped like a fan around the capstan of an Ampex 300 full-track mono tape machine at 30ips. The tape then ran through the recorder and fluttered as the rubber capstan bounced, and, by bringing back the output of the farkle to the mix, Botnick was able to attain the sought-after effect while adding plenty of echo from the famed Sunset Sound chamber and delaying it further via an Ampex 200 three-track at 15ips. The album opens with a recording of guitarist Steve Young performing "Black Jack Davy", a 17th-century ballad. When I played the album for Joe Smith, the president of the label, there was a stunned silence. Joe looked up and said, "Song Cycle"? I said, "Yes," and he said, "So, where are the songs?" And I knew that was the beginning of the end. Warner held the album for a year. Then I met Jac Holzman, and after he listened to it, he went to Warner Brothers and said, "If you folks aren’t going to release this album, I will—how much do you want for it?" So they decided to put it out, grudgingly. Nonetheless, Parks has expressed that the album hadn't turned out exactly as he wanted, saying "An album with no songs was entirely unintentional," and considered the album more of a learning exercise "made with a mindset about the importance of studio exploration." The album's sessions cost more than US$35,000 (exceeding US$240,000 today), making it one of the most expensive pop albums ever recorded up to that time — in 1967, the typical budget for a pop studio album was about $10,000 (US$70,000 today). an audacious and occasionally brilliant attempt to mount a fully orchestrated, classically minded work within the context of contemporary pop. As indicated by its title, Song Cycle is a thematically coherent work, one which attempts to embrace the breadth of American popular music; bluegrass, ragtime, show tunes – nothing escapes Parks' radar, and the sheer eclecticism and individualism of his work is remarkable. ...[T]he album is both forward-thinking and backward-minded, a collision of bygone musical styles with the progressive sensibilities of the late '60s; while occasionally overambitious and at times insufferably coy, it's nevertheless a one-of-a-kind record, the product of true inspiration. In response to the poor sales of the record after its release (despite some rave critical reviews), Warner Bros. Records ran full page newspaper and magazine advertisements written by staff publicist Stan Cornyn that said they "lost $35,509 on 'the album of the year' (dammit)." The ad said that those who actually purchased the album had likely worn their copies out by playing it over and over, and suggested that listeners send in worn out copies to Warner Bros. in return for two new copies, including one "to educate a friend with." Incensed by the tactic, Parks accused Cornyn of trying to kill his career. Excerpts from positive reviews were reprinted in these ads, which included statements written by the Los Angeles Free Press ("The most important art rock project"), Rolling Stone ("Van Dyke Parks may come to be considered the Gertrude Stein of the new pop music"), and The Hollywood Reporter ("Very esoteric"). Many musicians cite the album as an influence, including producer and songwriter Jim O'Rourke. O'Rourke worked with Parks and harpist Joanna Newsom on Newsom's record Ys. Joanna Newsom sought out the partnership with Van Dyke Parks after listening to Song Cycle. In July 2010, Continuum published a book in their 33⅓ series about Song Cycle, written by Richard Henderson. All tracks written by Van Dyke Parks, except where noted. Note: The song "Van Dyke Parks" above (credited as 'public domain') is actually an interpretation of "Nearer, My God, to Thee" dubbed over battlefield recordings of Vietnam. ↑ Grimstad, Paul. "What is Avant-Pop?". Brooklyn Rail. Retrieved 1 October 2016. 1 2 Kozinn, Allan (July 22, 2013). "'Smile' and Other Difficulties". The New York Times. nytimes.com. Retrieved 23 July 2013. 1 2 Henderson 2010, p. 63. ↑ Henderson 2010, p. 66. 1 2 Henderson 2010, pp. 77–78. ↑ Buskin, Richard (December 2003). "CLASSIC TRACKS: 'Strange Days'". Sound on Sound. Retrieved 7 August 2013. ↑ Henderson 2010, p. 68. ↑ Henderson 2010, p. 27. 1 2 3 Lake 2010, pp. 78. ↑ Miller, Jim (February 24, 1968). "Song Cycle". Rolling Stone (6). Archived from the original on October 1, 2007. ↑ Greene, Jayson (July 5, 2012). "Song Cycle review". Pitchfork Media. Retrieved 4 August 2013. ↑ Christgau, Robert (June 1968). "Columns". Esquire. Retrieved July 3, 2013. 1 2 Splice Today article: "INTERVIEW: Van Dyke Parks." 1 2 3 Henderson 2010. ↑ Goodman 1997, p. 79. ↑ "Interviewee's Favorite Albums". Perfect Sound Forever. furious.com. ↑ Davis, Erik (2006). ""Nearer the Heart of Things": Erik Davis profiles JOANNA NEWSOM". Arthur Magazine (25). Retrieved 4 August 2013. Goodman, Fred (1997). The Mansion on the Hill: Dylan, Young, Geffen, Springsteen and the Head-On Collision of Rock and Commerce. Pimlico. ISBN 978-0-7126-4562-1. Henderson, Richard (2010). Van Dyke Parks' Song Cycle. Continuum. ISBN 978-0-8264-2917-9. Lake, Kirk (2010). There Will Be Rainbows: A Biography of Rufus Wainwright. HarperCollins. ISBN 978-0-06-201871-7. Retrieved 4 August 2013. VanderLans, Rudy (1999). Palm Desert. Emigre. ISBN 978-0-9669409-0-9. Retrieved 4 August 2013. 33 1⁄3 blog page: "Van Dyke Parks – Song Cycle, by Richard Henderson. "Number Nine" / "Do What You Wanta"
"Come to the Sunshine" / "Farther Along"
"Donovan's Colours, Pt. 1" / "Donovan's Colours, Pt. 2"
"The Eagle and Me" / "On The Rolling Sea When Jesus Speak to Me"
"Occapella" / "Ode to Tobago"
"Wall Street" / "Money Is King"
"Dreaming Of Paris" / "Wedding In Madagascar (Faranaina)"
"Amazing Graces" / "Hold Back Time"
"The All Golden" / "Sassafrass"
"Missin' Missippi" / "The Parting Hand"
"I'm History" / "Charm School"